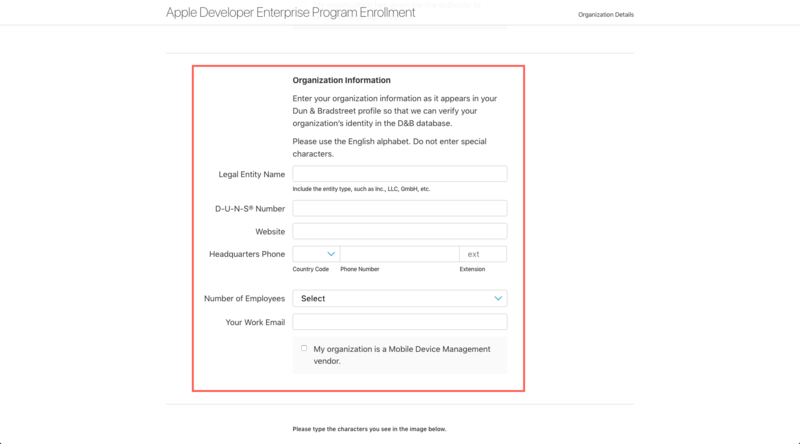 An Apple Enterprise Developer account is what you'll need in order to distribute internal apps for your company. The Enterprise program is ONLY intended for a company/organization who is creating an app to be used only by their employees. These apps should not be distributed to the general public or your customers under any circumstances. Your company/organization must be a legal entity. 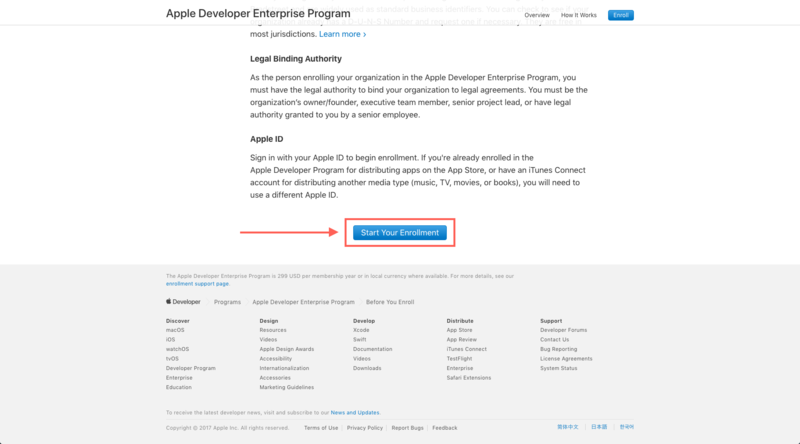 Apple does not accept DBAs, fictitious businesses, trade names, or branches. 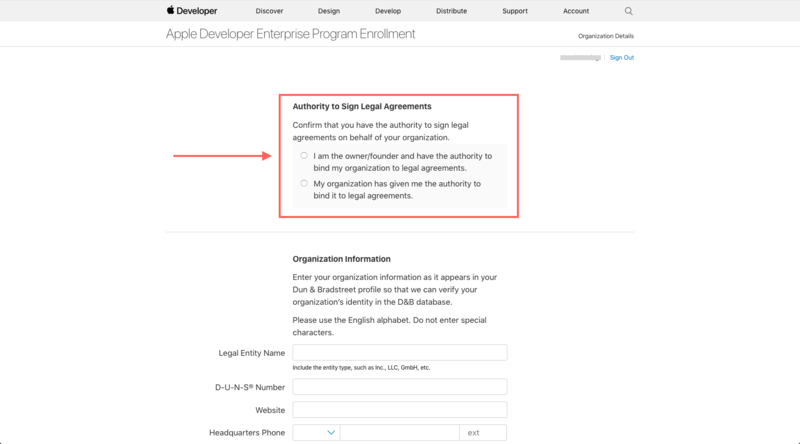 Your company/organization must have a D-U-N-S Number so that Apple can verify you are a legal entity. There is a possibility that your company may have had a D-U-N-S Number already assigned, so it's a good idea to check this before enrolling. You can see if your company already has a D-U-N-S Number here. You must be the organization’s owner/founder, executive team member, senior project lead, or have legal authority granted to you by a senior employee. 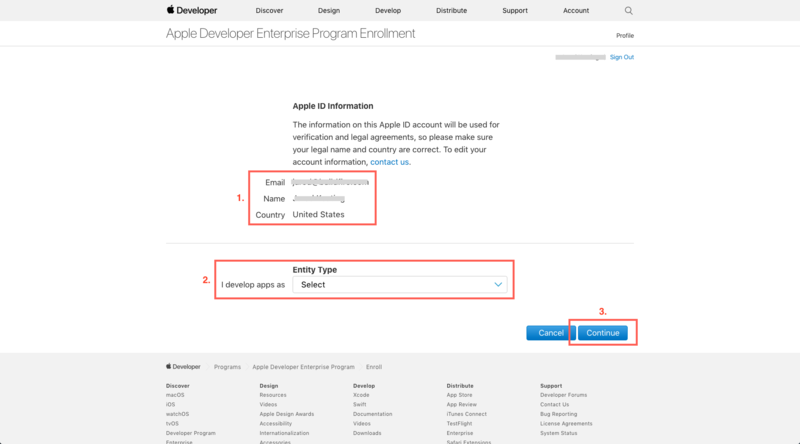 If you have already enrolled in Apple's standard Developer program with an existing Apple ID, you must enroll in the Enterprise program with a different Apple ID. After your account has been fully setup/activated, there is a 2 week (14 day) waiting period before we can create the files we need in your account. Step 2: Read through the "What You Need To Know" items, then click the Start Your Enrollment button at the bottom of the page. 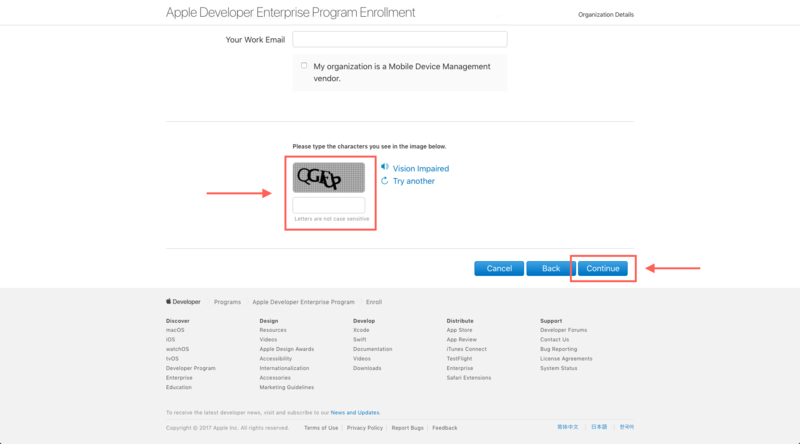 Step 5: Select the type of authority you have to enroll the company/organization in the Enterprise program. Step 6: Fill out your organization's information. Step 7: Fill out the CAPTCHA and click Continue. Once you have submitted your information, Apple contact you to verify your information and will provide a direct link so that you can make the payment to finalize your enrollment in the Enterprise program. VERY IMPORTANT: After your account has been fully setup/activated, there is a 2 week (14 day) waiting period before we can create the files we need in your account.